Looking for a fun way to get your kids to exercise both their brains and their minds, all while enjoying the charm of one of their favorite Disney characters? With Wild Planet Mickey's Mouse-ke-TAG from Today’s Concept, you can! 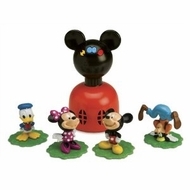 This fun game features a Mickey-shaped Clubhouse Tagger and four Mouse-ke-friend figures. Simply spread out the figures, let the Clubhouse Tagger give you clues on who to find, and go! The object is to tag the figures as fast as you can before time runs out. This game is both imaginative and fun, as children will have to decipher the clues to determine which of the Mouse-ke-friends they need to tag. The Wild Planet Mickey's Mouse-ke-TAG puts a modern spin on the classic game of tag. Providing physical exercise while promoting social and cognitive skills, one to six players can play Mouse-ke-TAG. Each of the four levels of Mouse-ke-TAG help children develop a different skill, from basic character recognition to learning letters so it is appropriate for a wide range of ages from three and up. Mickey's Mouse-ke-TAG also comes with two bonus games, Treasure Hunt and Memory Mouse-ke-TAG, for additional playtime. The colorful Mouse-ke-TAG parts and detailed pieces will interest children right out of the box. The lightweight, easy-to-hold Clubhouse tagger is shaped like Mickey Mouse. Its durable frame features easy-to-push buttons on the front for turning it on/off and choosing games and levels. The four Mouse-ke-friends, Mickey Mouse, Minnie Mouse, Goofy, and Donald Duck, fit firmly into each base and stand up well. The four friends each have fun, colorful details with an engaging expression. The game does contain small parts and is a choking hazard for infants so it's not appropriate for children under the age of three. The battery compartment is safely secured with a screw. The speakers are located in the front for very good sound quality. Advice for parents: you will need a small Phillips head screwdriver to insert the "AA" batteries. Be sure to follow the directions for battery ribbon placement in order to easily replace old batteries with new ones. Simultaneous Learning and Physical Exercise It's easy to set up the Mouse-ke-TAG game; simply spread out the Mouse-ke-friends and place them upright on their bases. The Clubhouse tagger calls out different clues depending on the level setting and the player runs to "tag" the correct Mouse-ke-friend by placing the tagger over it.